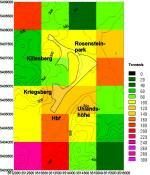 There is no current data on emissions in the plan area for Stuttgart 21 and its surroundings. The emission inventory, which is the basis for the clean air plan Stuttgart, dates from 1985. The updating of the inventory is in progress but not yet completed. First results are not to be expected before the spring of 1997. While the emissions of some pollutant components have been significantly decreased (e.g. sulphur dioxide, sedimenting particulate matter and lead) and pose no longer problems for air hygiene, we can assume that the ambient air concentration of nitrogen oxide has remained relatively stable. Its main source is traffic and nitrogen dioxide is the most important source for air pollution in present times. Another problem is benzene and soot in the proximity of roads (see also chapter 7). Figure 6-1 shows the nitrogen oxide emissions per square kilometre in the plan area and its surroundings. They range from almost 300 t/a per km² in the inner city to about 7 t/a per km² on the outskirts of Gablenberg. Nitrogen oxide emissions in the actual plan area range from about 70 to 130 t/a per km². What the emission inventory also shows is the fact that a very important source of nitrogen oxide emissions is traffic. Only a relatively small percentage can be attributed to domestic fuel. Business and industry contribute even less and the emissions are confined to only few of the areas under consideration.